Synapse analyzed the impacts of increasing the Connecticut Renewable Portfolio Standard. Synapse reviewed assumptions in Delmarva Power and Light’s benefit-to-cost analysis of its Advanced Metering Infrastructure (AMI) Initiative. Max Chang submitted testimony on behalf of Maryland OPC demonstrating that, due to unreasonable assumptions, DPL overestimated the benefit to cost ratio of the AMI program for the 2015-2024 period. Mr. Chang recommended that the Commission disallow $34 million in order to protect ratepayers. On behalf of the Office of the People's Counsel for the District of Columbia (OPC), Synapse evaluated several aspects of distributed generation in Washington, DC. This project consisted of three research topics. First, Synapse researched and offered recommendations regarding policies that can sustainably support the development of distributed generation in the District, while avoiding adverse consequences. Second, Synapse assessed the technical and economic potential for distributed generation in the District, particularly solar photovoltaics (PV). Finally, Synapse conducted a benefit-cost analysis of solar in the District. Synapse was retained by Earthjustice to draft a whitepaper discussing grid resiliency issues in the context of the United States Department of Energy (DOE)’s “grid resiliency pricing rule” proposal. DOE’s proposal directed the Federal Energy Regulatory Commission (FERC) to design rules that would guarantee full recovery of costs for all generating units operating in competitive wholesale markets with 90 days of fuel supply on-site (conventionally understood to refer to nuclear and coal-fired units). Synapse’s whitepaper discusses several key problems associated with this proposal: first, the authorities in charge of the nation’s wholesale energy markets (including FERC itself as well as ISO/RTOs and state agencies) have devoted substantial efforts to increasing the reliability and resiliency of the grid system and have reasonable, market-based approaches for accomplishing this goal. Second, fuel supply disruptions have not historically been a significant cause of service interruptions. 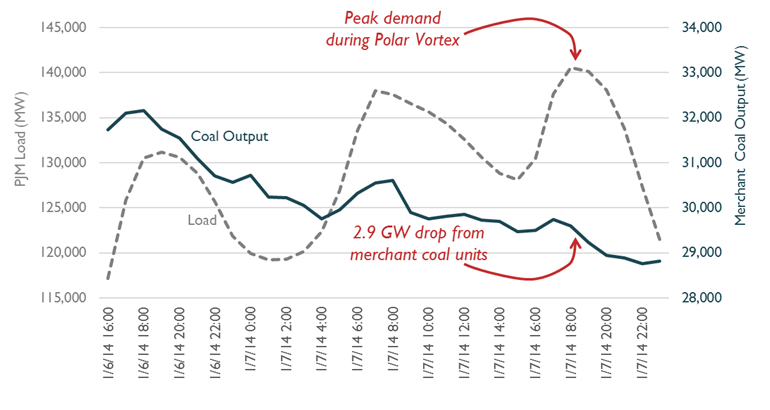 Third, coal units in particular are vulnerable to both fuel supply disruptions and other failures during extreme weather and temperature events, and have demonstrated decreasing reliability over time. Synapse’s whitepaper was filed under FERC docket RM18-1-000 in support of comments submitted by Earthjustice, Environmental Defense Fund (EDF), Natural Resources Defense Council (NRDC), Sierra Club, Sustainable FERC Project, the Union of Concerned Scientists (UCS), the Center for Biological Diversity, the Environmental Law and Policy Center, the Southern Environmental Law Center (SELC), Conservation Law Foundation (CLF), Environmental Working Group, and Fresh Energy. The Dakota Access pipeline, proposed in 2014, was designed to carry crude oil from the Bakken oil field in western North Dakota, through South Dakota and Iowa, to a pipeline hub in southern Illinois. The final stages of construction, not yet completed, have become the subject of a wide-ranging controversy involving multiple environmental, legal, cultural, and economic issues. In February 2017 Synapse produced a report based on research performed for Fredericks Peebles & Morgan LLP, attorneys for the Cheyenne River Sioux, addressing one dimension of the controversy: the economic impacts of completing the Dakota Access pipeline. As a continuation of previous work, Synapse provided NS UARB with consulting services on energy efficiency issues. Specifically, Synapse provided technical support and analysis with respect to rate and bill impacts, low-income program participation and performance, methodology to determine program incentives, and benefits of location-specific efficiency targeting. The Maryland Office of People’s Counsel retained Synapse to review the independent assessment of two offshore wind applications before the Maryland Public Service Commission in Case 9431. The two proposals under consideration are from US Wind for a 248 MW wind farm and Deepwater Wind for a 120 MW wind farm. Maryland's Offshore Renewable Energy Credit legislation establishes administrative thresholds for each offshore wind application and evaluation criteria for the Commission to use in its review. Synapse reviewed the findings, inputs, and calculations of the independent assessment and the two applications to provide recommendations regarding the renewable energy credit payments, ratepayer impacts, economic impacts, and net benefits attributed to each proposed project. Max Chang submitted testimony on behalf of MD OPC in March 2017. Madison G&E is seeking to build 66 MW of wind in Iowa in Docket 3270-CE-127. Synapse provided expert testimony on behalf of Sierra Club regarding the Company's assumptions and modeling. Key questions included whether or not larger turbines or simply a larger project would have been more economic. Synapse reviewed the Maritime Link Interim Cost Assessment. Specifically, Synapse analyzed the value of the Maritime Link asset to ratepayers given costs associated with a delay in delivery of energy via the Maritime Link. Further, Synapse assessed if the Maritime Link Project, approved by NS UARB in 2013, would be “used and useful.” Bob Fagan and Tyler Comings submitted joint direct testimony on these issues to the NS UARB. Synapse provided technical assistance and expert testimony on behalf of Conservation Law Foundation regarding the grid modernization plans of Eversource, National Grid, and Unitil in Massachusetts Department of Public Utilities dockets 15-120, 15-121, and 15-122. Synapse reviewed the methodologies and assumptions used by the companies in their plans. Synapse also assessed the extent to which the proposed plans meet the Department’s objectives for grid modernization, with particular focus on the plans’ incorporation of distributed energy resources as a key contributor to grid modernization. Sierra Club retained Synapse to review the draft parameters for Michigan’s impending IRP process proposed by the state’s governing agencies. Synapse found that, while most of the parameters were appropriate and up to standards for IRPs, Synapse identified a few areas in which changes could be beneficial for both planning participants and customers impacted by the IRP. Synapse’s comments to the Michigan Public Service Commission Staff outlined such changes, for example clarifying the relationship between the IRP process and the transmission and distribution and fuel planning processes; defining how utilities should select a preferred scenario; and modifying some modeling assumptions to better align with utility planning and ensure a more accurate, detailed, and robust analysis. Synapse is assisting the Michigan Public Service Commission in the development of a strategy to comply with EPA’s Clean Power Plan. To support the state planning process and evaluate compliance options, Synapse has built a detailed representation of the regional electrical system in System Optimizer, a utility-scale capacity expansion model. The model optimizes specific electric generating unit build and retire decisions, cost-effective energy efficiency, unit retrofit decisions, emissions trading programs, and emissions targets through 2034. Synapse developed Michigan-specific inputs to the model in collaboration with staff of the Public Service Commission, the Michigan Department of Environmental Quality, and the Michigan Agency for Energy. Synapse will use the model to test compliance plans developed by the joint agencies and stakeholders, including Michigan utilities, consumer, industry, and environmental groups. Synapse worked for the National Efficiency Screening Project (NESP) to develop a National Standard Practice Manual (NSPM). The purpose of the NSPM is to improve the way that utility customer-funded electricity and natural gas energy efficiency resources are evaluated for cost-effectiveness throughout the United States and to inform decision-makers regarding which efficiency resources are in the public interest and what level of investment is appropriate. The NSPM updates and expands upon the California Standard Practice Manual and will provide the principles, concepts, and techniques for sound, unbiased evaluation of energy efficiency and other demand side resources. Synapse's primary role was as the lead technical consultant and was responsible for the overall drafting of the manual, managing the Drafting Committee of five experts, and incorporating input from the Review Committee. Synapse and Raab Associates provided technical and facilitation support to New Hampshire PUC staff for a stakeholder process to address grid modernization issues and policies for the state. Synapse assisted with developing agendas for stakeholder meetings, providing technical and policy analyses, and communicating the results of those analysis. After the stakeholder process, Synapse assisted with compiling initial and final reports with recommendations from the stakeholder group. Advanced Energy Economy Institute retained Synapse to review earnings adjustment mechanisms proposed by National Grid in New York. Earnings adjustment mechanisms provide performance incentives for utilities that better align utility performance with regulatory goals. Tim Woolf and Melissa Whited filed testimony before the New York Public Service Commission that provided recommendations regarding which performance incentive mechanisms to approve, as well as appropriate financial incentive allocations. Synapse also prepared a report on state-wide performance incentive mechanisms for New York. The report examines some of the strengths and weaknesses of each of the three types of performance incentive mechanisms: outcome-based, program-based, and action-based. Because current efforts to implement performance incentive mechanisms in New York focus on outcome‐based mechanisms, the report provides an in-depth analysis of outcome-based performance incentives. Sierra Club retained Synapse to analyze Northern Indiana Public Service Company’s (NIPSO) request for rider on $400 million in capital costs at three coal-fired power plants in Indiana (Bailly, Michigan City, and Schahfer) as they seek to comply with the United States Environmental Protection Agency’s Coal Combustion Residual (CCR) rule and Effluent Limitation Guidelines (ELG). In this docket, NIPSCO seeks to retire four coal-fired units (Bailly 7 & 8 and Schahfer 17 & 18) while retaining three units (Schahfer 14 & 15 and Michigan City 12). Synapse assessed NIPSCO’s economic analysis and supporting “qualitative assessment” and examined whether the retention of the three units would be in the interest of ratepayers, and if the company’s qualitative assessment was reasonably constructed. Dr. Jeremy Fisher filed testimony demonstrating that NIPSO’s ratepayers see $200-$600 million in benefits with the incremental retirement of Schahfer 14 & 15 and that the Company’s application does not support the decision to install retrofits at the units. On behalf of Counsel to the Nova Scotia Utility and Review Board (NSUARB), Synapse assessed Nova Scotia Power's (NSPI) advanced metering infrastructure pilot proposal in 2017. NSPI requested approval to deploy advanced (“smart”) meters to up to 1,000 customers at a cost of $8.2 million. Ms. Alice Napoleon identified multiple issues with the proposal, including, among other things, that the pilot period would neither provide sufficient time for data collection nor cover the period of highest system demand; that the pilot’s size was not adequately justified; that complementary programs to help customers experience the benefits from implementation of AMI were omitted; and that the proposed network for the pilot is not consistent with the network that may be required for full implementation. The evidence concluded that the design of the proposed pilot would not provide a solid basis for determining whether the costs and benefits associated with AMI justify a full roll out. Ms. Napoleon recommended that NSUARB not approve the current pilot application based on the current record of evidence. To address deficiencies identified by Ms. Napoleon and others, NSPI withdrew its initial AMI application and stated its intention to submit an amended filing. In October, 2017, NSPI submitted an application to implement AMI throughout its service area. The application requested Board approval of a capital work order for $133 million to replace about 495,000 conventional meters with smart meters over the period 2018 to 2020. In early 2018, Alice Napoleon submitted evidence on behalf of the NSUARB regarding NSPI's proposal. Specifically, the evidence considered: 1. cost effectiveness of the proposal, including the magnitude of and support for claimed benefits such energy savings associated with critical peak pricing; 2. the reasonableness of allowing a return on the conventional meters to be replaced; and 3. coordination with the energy efficiency utility, EfficiencyOne, to enable benefits of the meters to be realized. In response to this evidence, NSPI submitted a sensitivity analysis to more fully consider the downside risks. The Board approved NSPI’s proposal subject to conditions but disallowed a return on the existing meters. Synapse submitted formal comments to the Department of Energy regarding its use of the Federal Power Act to allow continued operation of the Yorktown coal units in Virginia. Dr. Ariel Horowitz drafted the comments, which focused on the lack of a sound alternatives analysis, the imprudence of relying on elderly and inefficient coal units for reliability purposes, and the need for a near-term plan to retire the units. Utah Clean Energy engaged Synapse to review Pacificorp’s proposal before the Utah Public Service Commission to alter its net metering compensation mechanism for residential customers with distributed generation. Melissa Whited submitted testimony to the Commission critiquing multiple aspects of the Company’s proposed distributed generation rate design. Synapse’s analysis of the bill impacts showed that the Company’s proposed changes would have a substantial negative impact on the adoption of residential solar. The proposed distributed generation tariff would essentially eliminate the economic advantage to residential customers of installing distributed generation. Further, the Company’s plan to move these net-metered customers into a separate rate class would increase costs to non-net metered customers. Whited also testified that demand charges are not appropriate for residential customers. Tim Woolf submitted testimony addressing the Company’s flawed cost-benefit analysis. Based on Synapse’s finding that the benefits of the Company’s existing net metering program surpass the costs, Mr. Woolf recommended that the Commission not approve the proposed changes.